My online shop is FINALLY up! I always knew I needed a shop, but never took the steps because I was able to process all of my commissions directly with my clients. I’ve had this dream of making my own prints and stationary (and most of all, wallpaper), so I took the plunge and made this above, and this, below. I can’t decide which dark floral gift wrap I like better: the charcoal black or the chestnut burgundy. Cannot. Decide. So I made them both, and they are both magnificent!! I couldn’t have asked for better results. The resolution came out perfect and the colours….I’m so glad that I edited the print to look like they’re emerging from the background. The flowers look 3-D! Some of you even told me that they thought I had real flowers on top of the dark background! Here’s a little short video of what the dark floral gift wrap in charcoal black looks like. This gift wraps come in a roll and measures 26″ wide by 72″ long. It should be enough to wrap 4 medium sized gifts. It’s printed on one side, with a satin finish, and on medium weight paper. I was surprised by how sturdy the paper is and in fact, I can imagine the same weight of paper for posters. You can purchase these gift wraps on my online shop now. I am offering very limited quantities so if you want one, get one (or two) fast! Only shipping within Canada and the US for now (shipping is a nightmare as expected). I printed these through Spoonflower and I am very impressed by the quality, speed, and cost of their service. I have also listed these on my Spoonflower shop. I’ll definitely be using them again….wallpaper anyone??? Afterwards, I went a little mad taking photos of boxes wrapped in the gift wraps. I swear I took a million photos! The holidays are fast approaching so of course, I’m returning to The Paper Place in Toronto to teach a crepe paper holiday wreath workshop on Tuesday December 4. Really, it’s a foliage workshop where you’ll learn how to make olive branches (my staple in any of my arrangements), rosemary twig (fantastic little fillers for boutonnieres, and can you imagine them on your guest’s plate?? ), and ferns (remarkably quick to make). 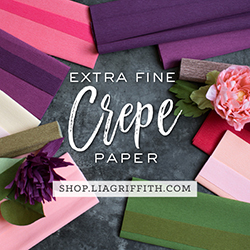 I’ll have a pre-made gold crepe paper wrapped “hoop” for you, along with berries, so you can arrange your foliage anyway you’d like for your wreath. Check out more details on my Workshop page.